The dendritic cell (DC) immunoreceptors (DCIR) and DC-immunoactivating receptors (DCAR) represent a subfamily of cell surface C-type lectin receptors (CLR), whose multifunctional capacities range from classical Ag uptake and immunoregulatory mechanisms to the involvement in DC ontogeny. On the basis of the generation of specific mAbs, we functionally characterized mouse DCAR1 (mDCAR1) as a member of the DCIR/DCAR family. Expression of mDCAR1 was strongly tissue dependent. mDCAR1 expression on DCs was restricted to the CD8+ DC subset in spleen and thymus and on subpopulations of CD11b+ myeloid cells in bone marrow and spleen, whereas the molecule was not detectable on both cell types in lymph nodes and peripheral blood. With respect to the function of CLRs as pattern recognition receptors, Ag delivered via mDCAR1 was internalized, was trafficked to early and late endosomes/lysosomes and, as a consequence, induced cellular and humoral responses in vivo even in the absence of CD40 stimulation. Intriguingly, upon triggering mDCAR1, CD8+ DCs increased the secretion of bioactive IL-12, whereas IL-10 release is markedly reduced, thereby indicating that Ag recognized by mDCAR1 induces enhanced proinflammatory responses. These data indicate that mDCAR1 is a functional receptor on cells of the immune system and provides further insights into the regulation of immune responses by CLRs. C-type lectins (CLEC)2 encompass a large family of proteins with varied functions. They contain one or more CLEC domains originally described as mediating carbohydrate-binding activity in a Ca2+-dependent manner (1). After characterization of several members of the family, the definition of the term CLEC has evolved and now also includes proteins containing CLEC-like domains (CTLD). CTLDs do not mediate interactions exclusively with carbohydrates but are able to bind ligands in the absence of calcium ions (2). CTLD-containing proteins, also referred to as CLEC receptors (CLR; Ref. 3), are categorized into 17 groups based on their phylogeny and domain organization (4). Of particular interest in the field of immunology are group II CLRs that are encoded within the Ag-presenting lectin-like receptor gene complex (APLEC) on human chromosome 12 (5, 6). Group II CLRs are type II transmembrane proteins and are frequently expressed by APCs and other phagocytes (7). They have been described as Ag uptake receptors for both pathogen-associated molecular patterns and self-Ags. Depending on the CLR-mediated endocytosis mechanisms, internalized Ags are routed into early endosomal or late endosomal/lysosomal compartments for degradation, loaded on MHC class I and II molecules, respectively, which then leads to the regulation of Ag-specific immune responses (3, 8). In addition, APLEC-encoded CLR genes have been associated with susceptibility to autoimmune diseases, such as arthritis (9, 10, 11). Examples for the APLEC-encoded group II CLRs are the recently identified BDCA-2 (CD303) and dendritic cell (DC) immunoreceptor (human DCIR (hDCIR) or CLECSF6). CD303 is expressed exclusively on the cell surface of plasmacytoid DCs (PDC; Ref. 12), whereas hDCIR expression can be detected on monocytes, macrophages, DCs, neutrophils, and B cells (13, 14, 15, 16). Both receptors have been shown to induce receptor-mediated endocytosis, leading to modulation of adaptive immune responses (15, 16, 17). Moreover, they regulate DC-induced immunity by inhibition of TLR-induced cytokine profiles (15, 16, 18), which might be a possible mechanism for pathogens to evade immune responses (19). In mice, APLEC-encoded group II CLRs are located on chromosome 6. Among these are the receptors mDCIR, mDCIR2, and DC immunoactivating receptor (mDCAR). mDCIR and mDCAR are considered paired immunoregulatory receptors, and their mRNA transcripts have been detected in APCs and other phagocytes (20, 21). However, their expression pattern and function have not been clarified due to the lack of specific mAbs. mDCIR2, recognized by the mAb 33D1, was reported to function as an Ag uptake receptor on CD4+ DC (22), one of the three conventional DC subsets described in murine spleen (23). Here, we report a novel group II CLR, mDCAR1, which is expressed exclusively on CD8+ DC and subpopulations of myeloid cells in a tissue-dependent manner. We show that Ag delivered via mDCAR1 is presented on both MHC class I and II molecules and that receptor triggering on DC leads to enhanced proinflammatory cytokine responses. As a consequence, targeting mDCAR1 in vivo induced CD8+- and CD4+-proliferative T cell and humoral responses. Wistar-Furth rats and BALB/c and C57BL/6N mice were purchased from Harlan Laboratories. OVA-specific CD8 (OT-I) and CD4 (OT-II) TCR-transgenic mice (C57BL/6N background; CD45.2) were derived from our breeding facilities (Miltenyi Biotec). C57BL/6J (CD45.1) mice were obtained from Charles River Laboratories. Animals were used at 4–12 wk of age, and all experiments were performed according to national and institutional animal care and ethical guidelines. Nucleotide sequences of BDCA-2 (CD303) and hDCIR were blasted online against mouse genome databases (http://blast.ncbi.nlm.nih.gov/Blast.cgi) for identification of mouse orthologs. The National Center for Biotechnology Information nucleotide accession number entries (http://www.ncbi.nlm.nih.gov) of the sequences used were: CD303 (AF325460); hDCIR (AJ133532); mDCIR (AJ133533); mDCIR2 (AY397673); mDCIR3 (AY397674); mDCIR4 (AY397675); mDCAR (AY230259); and mDCAR1 (AY365133). Amino acid sequences of the CLR were derived from UniProt Knowledgebase (Swiss-Prot and TrEMBL) entries (http://www.expasy.org) according to their primary accession numbers: CD303 (Q8WTT0); hDCIR (Q9UMR7); mDCIR (Q9QZ15); mDCIR2 (Q5YIR8); mDCIR3 (Q8JZX6); mDCIR4 (Q80UI7); mDCAR (Q7TS58); and mDCAR1 (Q67DU8). Multiple sequence alignment was performed online by use of DIALIGN-TX (http://dialign-tx.gobics.de/) as described previously (24, 25). Potential protein domains and signaling motifs were predicted by use of PROSITE (http://www.expasy.org/prosite/). All quoted cell lines and in vitro cultures were kept in RPMI 1640 (Miltenyi Biotec) supplemented with 10% (v/v) heat-inactivated, filtered (<0.2 μm pore size) FCS (PAA Laboratories), 2 mM l-glutamine, 1 mM sodium pyruvate, 100 U/ml penicillin, 100 μg/ml streptomycin, 50 μM 2-ME, and 20 mM HEPES (all from Invitrogen) at 37°C in a humidified 5% CO2-containing atmosphere. Ab-producing hybridoma were cultured in DMEM (Miltenyi Biotec) supplemented with 10% (v/v) heat-inactivated, filtered (<0.2 μm) FCS (Biochrom), 2 mM l-glutamine, and 20 mM HEPES at 37°C in a humidified 9% CO2-containing atmosphere. cDNA coding for full-length mDCAR1 was isolated by PCR amplification from whole splenic cDNA using the primers 5′-ggcggatccATGCAGGAAAGACCAGCC-3′ and 5′-tgctgtttaaacATGTGATTCATAAGTATA-3′ (gene-specific sequence in capital letters; BamHI and EcoRI restriction sites are underlined). The resulting fragment was cloned into a modified pEF6 vector (Invitrogen) containing an HA tag (gene sequence ATGGGCTACCCATATGACGTCCCAGACTACGCT) between the promoter and the mDCAR1 gene. As a control, HA-encoding pEF6 vector without mDCAR1 was used. The expression and control vector were transfected into Chinese hamster ovary (CHO) cells and rat basophilic leukemia (RBL-1) cells by electroporation and expression controlled by staining with anti-HA mAb (clone GG8-IF3.3; Miltenyi Biotec). Selection of mDCAR1+ cells was performed by administration of 5 μg/ml blasticidin (Invitrogen) and subsequent cloning by limiting dilution. Anti-mDCAR1 mAbs were generated using contralateral footpad immunization. Four-week-old Wistar-Furth rats were immunized four times (days 0, 4, 7, and 10) in the right footpad with 5 × 106 mDCAR1-expressing RBL-1 cells and 150 μg of CpG1826 (Metabion) per boost. Vector-control transfected RBL-1 cells (5 × 106) and CpG were applied at days −3, 0, 4, 7, and 10 into the left footpad per boost. Lymph node cells were fused with the mouse myeloma cell line SP2/0 at day 11. Hybridoma cells secreting specific mAbs against mDCAR1 (anti-mDCAR1 SKa5-3D5, -4B2, -16D2, and -12B11, all of rat (r) IgG2b isotype) were identified by flow cytometry analysis of cell culture supernatants using a combination of mDCAR1 and control vector-transfected RBL-1 and CHO cells. Cross-blocking experiments were performed on mDCAR1-expressing RBL-1 transfectants by incubating pure anti-mDCAR1 mAb (50 μg/ml) before labeling with fluorochrome-conjugated anti-mDCAR1 mAb. Single-cell suspensions from mouse spleen, mesenteric, inguinal, and popliteal lymph nodes and thymus were prepared by enzymatic disaggregation with collagenase D (Roche). Bone marrow cells were isolated by flushing femurs with PBS supplemented with 0.5% (w/v) BSA and 5 mM EDTA. Peripheral blood cells were obtained from sacrificed mice and erythrocytes were removed by lysis in iso-osmotic ammonium chloride buffer. Single-cell suspensions were incubated with mouse FcR Blocking Reagent (Miltenyi Biotec) before addition of fluorochrome-conjugated specific mAb. For phenotypic analysis, anti-mDCAR1 mAb (clone SKa5-3D5) was labeled in combination with various mAbs (clone names in parentheses) according to manufacturer’s protocols: CD11c (N418); CD8α (53-6.7); CD205 (NLDC-145); CD11b (M1/70.15.11.5); CD4 (GK1.5); mPDCA-1 (JF05-1C2.4.1); anti-MHCII (M5/114.15.2); anti-Gr-1 (RB6-8C5); CD40 (FGK45.5) (all from Miltenyi Biotec); anti-mDCIR2 (33D1); CD80 (16-10A1); CD86 (GL1), all from BD Biosciences, BP-1 (6C3; eBioscience), F4/80 (CI:A3-1; Serotec). Propidium iodide (Sigma-Aldrich) was added at a final concentration of 1 μg/ml immediately before flow cytometric acquisition to exclude dead cells from analysis. Data were acquired on a FACSCalibur flow cytometer (BD Biosciences) and analyzed using FlowJo software (Tree Star). Gates were set according to fluorochrome-conjugated isotype control stainings using mAb hamster IgG1 (A19-3), rIgG1 (R3-34), rIgG2a (R35-95), rIgG2b (A95-1), all from BD Biosciences. Frozen splenic tissue sections (5–10 μm; BioChain) derived from BALB/c mice were incubated for 15 h at 4°C with the following mAb conjugates diluted in PBS containing 1% BSA and FcR Blocking Reagent (Miltenyi Biotec): biotinylated anti-mDCAR1 (clone SKa5-3D5) and fluorochrome-conjugated F4/80 (CI:A3-1; Serotec); CD8α (53-6.7); CD45R (B220; RA3-6B2), both from Miltenyi Biotec; and anti-mouse SIGNR1 (22D1; eBioscience). Tissue sections were counterstained for 1 h at 4°C with streptavidin-allophycocyanin-eFluor 780 or streptavidin-Alexa Fluor 488 (Invitrogen). Isotype control mAb conjugates (BD Biosciences) were used at same concentrations as primary mAb. Endogenous biotin was blocked with Biotin-Blocking Kit (Invitrogen) before labeling with primary mAb. Sections were mounted in fluorescent mounting medium (Dako) and analyzed on a Leica TCS SP-2 CLSM. Splenic CD8+ DC were isolated using a mouse CD8+ DC Isolation Kit (Miltenyi Biotec). Briefly, single-cell suspensions were depleted of CD90.2+, CD45R (B220)+, and CD49b+ cells, and DCs were subsequently enriched via CD8α MicroBeads. Sorted DC always reached a purity of >95%. OVA-specific transgenic CD45.2+CD8+ (OT-I) and CD4+ (OT-II) T cells were isolated using either a CD8+ or a CD4+ T cell Isolation Kit (Miltenyi Biotec), respectively. Briefly, single-cell suspensions were depleted of CD8α+ or CD4+, CD45R (B220)+, CD49b+, CD11b+, and Ter-119+ cells. Sorted T cells always reached a purity of >98%. Isolated splenic CD8+ DC were labeled with 1 μg/ml allophycocyanin-conjugated anti-mDCAR1 mAb (SKa5-3D5) or isotype-matched control rIgG2b (A95-1; BD Biosciences) for 20 min on ice. Cells were washed with ice cold PBS supplemented with 0.5% (w/v) BSA and 5 mM EDTA and labeled with biotinylated anti-allophycocyanin mAb (Miltenyi Biotec) for 10 min on ice. Cells were washed with medium and then incubated on ice or at 37°C for indicated periods of time. Cross-linked mAb complexes remaining on the cell surface were determined by FACS analysis via labeling with PE-conjugated anti-biotin mAb (Miltenyi Biotec). For analysis of intracellular trafficking of internalized mAb, enriched CD8+ DCs were labeled with biotinylated anti-mDCAR1 mAb (SKa5-3D5), CD205 (NLDC-145), or isotype-matched control rIgG2b (A95-1; BD Biosciences) for 30 min on ice followed by streptavidin-Alexa Fluor 488 (Invitrogen) for 20 min on ice and incubated in medium for the indicated time points at 37°C. DCs were fixed in PBS containing 1.8% paraformaldehyde for 20 min and permeabilized with 0.1% saponin for 20 min before staining with CD107a (LAMP-1)-Alexa Fluor 647 (eBioscience) or rabbit anti-EEA1 mAb (Cell Signaling) and anti-rabbit IgG (H + L)-Alexa Fluor 647 (Invitrogen). Cells were centrifuged on coverslips, mounted in VectraShield (Vector Laboratories), and analyzed on a Leica TCS SP-2 CLSM. DTT-reduced anti-mDCAR1 mAb (SKa5-3D5), CD205 mAb (NLDC-145), and isotype-matched control mAb rIgG2b (JES10-S42) (Miltenyi Biotec) were chemically coupled to maleimide-activated OVA (Pierce Biochemical), as described previously (26). Conjugates were purified using size exclusion chromatography (Superdex 200; Amersham). PAGE and Western blot analysis were performed to control purity of the conjugates. The amount of OVA conjugated to the mAb was determined by ELISA (not shown). Enriched CD45.2+CD8+ (OT-I) and CD4+ (OT-II) T cells were labeled with CFSE (Molecular Probes; 1 μM) and injected i.v. into C57BL/6J (CD45.1) mice (106 cells). After 18 h, increasing concentrations (0.5–5 μg) of OVA-conjugated anti-mDCAR1 mAb (containing 50–500 ng of OVA), 2.5 μg of CD205 mAb (250 ng of OVA), or 0.5–5 μg of rIgG2b mAb (50–500 ng of OVA) or 500 ng of soluble OVA (Pierce Biochemical) were injected i.v. with or without 25 μg of CD40 mAb (FGK45.5; Miltenyi Biotec). In vivo blocking of mDCAR1 internalization was achieved by i.v. injection of 250 μg of anti-mDCAR1 mAb (SKa5-3D5) together with isolated transgenic CD45.2+ T cells 1 day before mDCAR1-OVA conjugate was applied. Three days later, splenocytes were analyzed with fluorochrome-conjugated mAb against CD4 (GK1.5) or CD8 (53-6.7; Miltenyi Biotec) and CD45.2 (104; BD Biosciences). Propidium iodide (Sigma-Aldrich) was added at a final concentration of 1 μg/ml immediately before acquisition to exclude dead cells from analysis. Data were acquired on a FACSCalibur flow cytometer (BD Biosciences) and analyzed using FlowJo software (Tree Star). Proliferating CD45.2+CD8+ (OT-I) and CD4+ (OT-II) T cells were visualized by loss of CFSE fluorescence. Serum samples were obtained after 2 wk from mice immunized i.v. with 1 μg of OVA-conjugated anti-mDCAR1 mAb, 1 μg of rIgG2b mAb, or 1 μg of CD205 mAb with or without 25 μg of CD40 mAb. ELISA plates (Greiner Bio-One) were coated with 10 μg/ml OVA (Pierce Biochemical) for 2 h and blocked overnight (PBS, 0.05% Tween, 1% BSA). Diluted serum samples were plated and incubated at 37°C for 2 h. Peroxidase-conjugated goat anti-mouse IgG (Jackson ImmunoResearch Laboratories) was plated and incubated at 37°C for 1 h. Anti-OVA serum Ab was determined by ELISA. Anti-OVA mAb (Miltenyi Biotec; clone SK1-3C7) was used as standard. Isolated splenic CD8+ DC were cultured at 106 cells/ml for 24 h in a 48-well plate (500 μl/well) in the presence or absence of 5 μg/ml anti-mDCAR1 mAb or isotype-matched control mAb rIgG2b (JES10-S42; Miltenyi Biotec). For stimulation, cultures were incubated on a monolayer of CD40L-expressing 3T3 cells supplemented with 5 μg/ml CpG1668 (Metabion). Supernatants were analyzed via ELISA for IL-12p70, TNF-α, and IL-10. Ab pairs used were 18.2 and 17.8 for IL-12p70 and 1F3F3D4 and XT3 for TNF-α (Miltenyi Biotec). BD OptEIA Mouse IL-10 ELISA Set (BD Biosciences) was used to determine IL-10. Statistical analysis was performed using a one-tailed Student t test for differences among groups. Data are expressed as means ± SEM unless otherwise stated. To identify murine group II CLRs that are related to BDCA-2 (CD303) and hDCIR, we and others (6) conducted an extensive similarity search via Internet-based basic local alignment search tool in protein databases as well as in genomic sequences of mouse genome databases. Six mouse genes were identified forming two subfamilies of CLR. The mDCIR family comprises four genes encoding mDCIR, mDCIR2, mDCIR3, and mDCIR4, as well as the mDCAR family consisting of the genes for mDCAR and mDCAR1. The chromosomal position of the genes was compared with those of CD303 and hDCIR (Fig. 1⇓A). The genes were localized on the APLEC on human chromosome 12 or the corresponding mouse chromosome 6, adjacent to the genes of the CLR Dectin-2, Mcl, and Mincle. The non-CLEC genes GDF3, SLC2A3, and C3AR were found upstream of hDCIR flanking the CD303 gene. The ortholog cluster on the mouse chromosome lacked a CD303-related CLR fragment. The mDCIR/mDCAR family genes are located upstream of C3AR, corresponding to the position of the hDCIR gene. Comparison of the DCIR/CD303/DCAR family. A, Chromosomal comparison of human and mouse APLEC. The human APLEC contains the BDCA-2 (CD303) and hDCIR genes on chromosome 12 (chr12; top diagram). The corresponding mouse region on chromosome 6 (bottom diagram) is characterized by the absence of a CLR gene homolog to CD303 but contains a cluster of four mDCIR and two mDCAR genes. B, Comparative domain structure analysis of DCIR/CD303/DCAR family members. The members of the DCIR/CD303/DCAR family are predicted type II transmembrane (TM) proteins. Their CTLDs are highly conserved. CD303, mDCAR, and mDCAR1 share a short cytoplasmic domain without any known signaling motifs but a positively charged amino acid. R, arginine; K, lysine. hDCIR, mDCIR, and mDCIR2 cytoplasmic domains contain conserved motifs important for cell signaling (ITIM), whereas mDCIR3 and mDCIR4 lack such signal transduction motifs. To examine the homology of the two human and six mouse CLR, they were compared according to their predicted protein domains (Fig. 1⇑B). All CLRs were characterized by a highly conserved extracellular CTLD, a short neck, and one transmembrane domain. The intracellular domains categorized the receptors into two groups. mDCAR, mDCAR1, and CD303 share a short tail facing the cytosol; whereas the human and mouse DCIR proteins are marked by a long N terminus. The cytoplasmic regions of hDCIR, mDCIR, and mDCIR2 carry an ITIM, whereas mDCIR3 and mDCIR4 contain a conserved tyrosine residue, however, not in the consensus of an ITIM signal transduction motif. In the following, we focused on the characterization of mDCAR1. cDNA was cloned from splenocytes and stably transfected into the RBL-1 cell line which was then used for contralateral footpad immunization of rats. Generation of mAbs yielded four Ag-specific clones, all recognizing the same epitope as determined by cross-blocking experiments on mDCAR1-transfected CHO cells (data not shown). One representative clone, SKa5-3D5, was used to specifically recognize mDCAR1-transfected RBL-1 cells in a mix with control-transfected RBL-1 cells in flow cytometry (supplemental Fig. 1).3 All additional experiments were performed with this clone. To investigate the expression pattern of mDCAR1, we used fluorochrome-conjugated anti-mDCAR1 mAb to analyze murine tissues by flow cytometry. mDCAR1 expression was detected on a subset of CD11c+ DC and CD11c− cells in spleen (Fig. 2⇓A). The mDCAR1+CD11c+ subset represented 0.6% of all splenocytes and was further characterized by expression of CD8 and CD205, low amounts of CD11b, and the absence of CD4 and mPDCA-1. The mDCAR1+ cells expressed high amounts of MHC class II molecules and moderate levels of costimulatory molecules CD40, CD80, and CD86. mDCAR1+ DC lacked the CD4+ DC-specific marker mDCIR2 (33D1). Analysis of gated DC subsets revealed that mDCAR1 was expressed by all CD8+ DCs in spleen (data not shown). mDCAR1 is expressed in a tissue-dependent manner on CD8+ DC and subpopulations of myeloid cells. Cell suspensions from mouse tissues and peripheral blood were stained with fluorochrome-conjugated anti-mDCAR1 and CD11c mAb (dot plots) and indicated mouse cell surface markers (histograms) and were analyzed via flow cytometry. Propidium iodide fluorescence and light scatter signals were used for gating of live cells. Numbers in the dot plots indicate percentage of mDCAR1+ cells of the CD11c+ or CD11c− cell compartment. Histograms display mDCAR1-gated cells, lines reflect staining with fluorochrome-conjugated isotype-matched control mAb of the appropriate cell surface marker (shaded gray histograms). mDCAR1 expression was analyzed in spleen A, thymus C, BM (D), inguinal lymph nodes, and peripheral blood (E). Mesenteric and popliteal lymph nodes were analyzed as well (data not shown). B, mDCAR1 expression in spleen is restricted to white pulp. mDCAR1 expression pattern was analyzed on tissue sections of mouse spleen and counterstained with CD8 (T cell zone), B220 (B cell follicles), SIGNR1 (marginal zone macrophages) and F4/80 (red pulp macrophages). MHCII, MHC class II. The mDCAR1+ CD11c− cells were characterized by expression of the myeloid markers CD11b, CD31, and Gr-1 (Ly6G/C). They were heterogeneous for the expression of F4/80, and the prominent mDCAR1+ compartment expressed CD205. Whereas CD11b was expressed on 20% of all splenocytes, mDCAR1 expression was detected on 10% of the CD11b+ compartment (Fig. 2⇑A and data not shown). mDCAR1+ splenic myeloid cells were found to be negative for marker further defining monocyte/macrophage subsets, such as SIGNR1, MOMA-1, MOMA-2, and MARCO (data not shown). We therefore analyzed mDCAR1 expression pattern on tissue sections of mouse spleen. mDCAR1 was selectively expressed within the white pulp, predominantly in T cell zones, where CD8+ DCs reside, and to a lower extent in B220+ B cell-rich follicles (Fig. 2⇑B). SIGNR1+ marginal zone macrophages and F4/80+ red pulp macrophages were distinct from mDCAR1+ myeloid cells, as no coexpression was detectable. In the thymus, mDCAR1 expression was restricted to the CD8+CD205+CD11b−/lowMHC class IIhigh DC compartment (CD4−mPDCA-1−), whereas on CD11b+ myeloid cells the CLR was not detectable (Fig. 2⇑C and data not shown). In contrast to splenic DC, the thymic mDCAR1+ cells showed heterogeneous and increased expression level of CD40, CD80, and CD86. BP-1 confirmed the restriction of mDCAR1 expression to this DC subset (27). DCs in bone marrow (BM) did not show detectable levels of mDCAR1 (Fig. 2⇑D). However, the phenotype of mDCAR1+ BM cells corresponded to the splenic myeloid cells (CD11b+Gr-1dim/+F4/80dim/+CD205+CD31dim/+). Whereas CD11b was expressed on 50% of all BM cells, mDCAR1 expression was detected on 10% of the CD11b+ compartment (data not shown). Unexpectedly, mDCAR1 expression could be detected neither on the cell surface of DC nor on myeloid cells present in mesenteric, inguinal, and popliteal lymph nodes or circulating through peripheral blood (Fig. 2⇑E and data not shown). Additionally, mDCAR1 expression could not be induced on in vitro generated BM-DC (Flt-3L or GM-CSF/IL-4; supplemental Fig. 2). Upon activation with stimulatory agents, i.e., TLR agonists or CD40L, mDCAR1 is down-regulated on both DCs and myeloid cells (data not shown). As a result, in the lympho-hematopoietic system, mDCAR1 surface expression appeared in a tissue-dependent manner on the CD8+ DC subset in spleen and thymus and on subpopulations of myeloid cells in spleen and BM. A prominent function of CLR is the sensing of Ags and their uptake (3). We therefore addressed the question of whether mDCAR1 mediates endocytosis after receptor cross-link by performing internalization experiments. Freshly isolated splenic CD8+ DCs were labeled with anti-mDCAR1 mAb conjugate and cross-linked with secondary conjugates on ice. mDCAR1 on the cell surface was detected after 1 and 2 h of incubation at 4°C and 37°C. mDCAR1:anti-mDCAR1 mAb complexes were stably detectable when incubated at 4°C (Fig. 3⇓A). In contrast, the cell surface level of mDCAR1 was reduced to 50% (compared with mean fluorescence intensity at t = 0 min) after 1 h of incubation at 37°C, further decreasing after 2 h (65%). Comparable results were obtained for thymic DCs as well as for myeloid cells in spleen and BM (data not shown). mDCAR1 mediates delivery of bound Ab into the Ag-processing pathway. A, mDCAR1 is internalized upon receptor triggering. CD8+ DCs were labeled with allophycocyanin-conjugated anti-mDCAR1 mAb followed by incubation with anti-allophycocyanin-biotin mAb. Cross-linked mDCAR1 on the cell surface was detected with PE-conjugated anti-biotin mAb after incubation at 4°C or 37°C and at indicated time points. Data are means ± SEM derived from three independent experiments. B, Internalized anti-mDCAR1 mAb is trafficked into the Ag-processing pathway. Freshly isolated splenic CD8+ DC were labeled with biotinylated anti-mDCAR1 mAb (top rows), CD205 mAb (bottom rows), or isotype-matched control mAb (data not shown) followed by Alexa Fluor 488-conjugated streptavidin (red) on ice. DCs were fixed and intracellularly stained with early endosomal marker EEA1 and late endosomal/lysosomal marker LAMP-1 (green) after incubation at 37°C for the indicated time points before analysis via confocal laser scanning microscopy. Coexpression of proteins is depicted in yellow. Data are representative of at least three independent experiments. To follow the fate of internalized mAb, splenic CD8+ DCs were analyzed via confocal laser scanning microscopy. After incubation at the indicated time points, DCs were intracellularly stained for early endosome Ag 1 (EEA1) and LAMP-1 (CD107a), a marker for late endosomes/lysosomes. In the first 30 min, anti-mDCAR1 mAb was internalized, whereas low amounts colocalized with EEA1 in early endosomes (Fig. 3⇑B). During the following hours, anti-mDCAR1 mAb was entirely routed into LAMP-1+ late endosomal/lysosomal compartments. Thus, mDCAR1 can mediate delivery of bound Ab to the endocytotic pathway. The intracellular trafficking of internalized anti-mDCAR1 mAb resembled that of CD205 mAb (Fig. 3⇑B), raising the question whether comparable immune responses are initiated after receptor-mediated Ag uptake. To assess whether uptake of Ag via mDCAR1 leads to processing and presentation, we investigated the induction of an Ag-specific, proliferative T cell response after internalization of OVA via anti-mDCAR1 mAb in vivo. Therefore, anti-mDCAR1 mAb, CD205 mAb, and isotype-matched control mAb were chemically coupled to OVA protein, resulting in conjugates consisting of 10% OVA (w/w) (supplemental Fig. 3 and data not shown). OVA-conjugates were injected into CD45.1+ mice 1 day after adoptive transfer of CFSE-labeled, OVA-specific CD45.2+CD8+ (OT-I) and CD45.2+CD4+ (OT-II) T cells. After 3 days, the proliferative response of CD45.2+ T cells was determined by flow cytometry as a reduction of CFSE fluorescence. Only mice immunized with OVA-conjugated anti-mDCAR1 mAb were able to induce a proliferative response of both CD8+ and CD4+ T cells (Fig. 4⇓A). Because the application of pure mAb did not result in depletion of mDCAR1+ cells, e.g., CD8+ DCs (supplemental Fig. 4), the specificity of the Ag targeting was verified by blocking the receptor-mediated Ag uptake. Targeting Ag via mDCAR1 induces enhanced immune responses in vivo. A, OVA-specific transgenic CD45.2+CD8+ (OT-I) and CD4+ (OT-II) T cells were labeled with CFSE and adoptively transferred into CD45.1+ mice. On day 1 posttransfer, OVA-conjugated anti-mDCAR1 mAb or isotype-matched control rIgG2b mAb were injected i.v. with CD40 mAb. On day 4, splenocytes were analyzed by flow cytometry for CD8- or CD4-gated T cells. A proliferative response was determined by loss of CFSE fluorescence on grafted CD45.2+ T cells. Anti-mDCAR1-OVA targeting was blocked by coinjection of anti-mDCAR1 mAb with T cell transfer. Dot plots are representative of three independent experiments. B, Anti-mDCAR1-OVA induces stronger T cell proliferation than OVA alone even in the absence (w/o) of CD40 stimulation. Titrated amounts of OVA-conjugated anti-mDCAR1 mAb, CD205 mAb, or soluble OVA were injected with or without CD40 mAb. Histograms are representative of three independent experiments gated on CD8+ (OT-I) or CD4+ (OT-II) CD45.2+ T cells. C, Targeting mDCAR1 induced humoral responses even in the absence of CD40 stimulation. Serum samples were derived from mice immunized with OVA-conjugated CD205 mAb, isotype-matched control, or anti-mDCAR1 mAb, with or without CD40 mAb. Concentrations of anti-OVA serum Ab were determined by ELISA. Each circle represents an individual mouse, the line represents the geometric mean. D, Triggering mDCAR1 has no impact on activation status of DC. Mice were injected with anti-mDCAR1 mAb or left untreated. After 18 h, splenic CD8+ DC were analyzed for their expression of MHC class II and costimulatory molecules by flow cytometry. Data of three independent experiments are shown as the geometric mean fluorescence intensity (MFI) of expressed molecules on CD8+ DCs. The efficiency of mDCAR1-mediated Ag uptake was analyzed and compared with processing and presentation of soluble OVA protein and OVA coupled to the multilectin CD205 mAb. The titration of OVA-conjugated anti-mDCAR1 mAb revealed that induction of T cell proliferation was highly efficient and comparable with CD205-mediated uptake (Fig. 4⇑B). No Ag-specific T cell response was observed in mice immunized with soluble OVA protein <500 ng. When delivering low amounts of OVA (50 ng) conjugated to mAb, presented peptides still initiated a remarkable OT-I response, whereas CD4+ T cell proliferation was less efficient. Administration of low doses of fluorochrome-conjugated anti-mDCAR1 mAb (<1 μg) preferentially labeled CD8+ DCs rather than myeloid cells (supplemental Fig. 5), indicating that anti-mDCAR1 mAb predominantly targets CD8+ DC in vivo. Induction of T cell proliferation was observed without CD40 stimulation when targeting mDCAR1, as already shown for CD205 (26). However, in contrast to CD205, mice immunized with anti-mDCAR1-OVA induced enhanced humoral responses in the absence of CD40 mAb, as determined by analyzing the levels of anti-OVA serum Ab (Fig. 4⇑C). Triggering mDCAR1 does not influence the activation state of DC, as expression levels of MHC class II molecules, CD40, CD80, and CD86 were not influenced on the CD8+ DC subsets of mice injected with anti-mDCAR1 (Fig. 4⇑D). In summary, mDCAR1-mediated transfer of OVA into the Ag presentation pathway led to efficient induction of Ag-specific immune responses. CLR triggering has been shown to polarize effector function by regulating the cytokine secretion of the cell (28). To address the impact of mDCAR1 cross-linking on the cytokine profile of DCs, CD8+ DCs were incubated with anti-mDCAR1 mAb or isotype-matched control mAb in the presence or absence of DC stimuli. Because the use of either CD40L or CpG resulted in a negligible cytokine response, both stimuli were used synergistically (data not shown) (29). After 20 h, supernatants were harvested and secreted IL-12p70, TNF-α, IFN-α, and IL-10 were determined by ELISA. 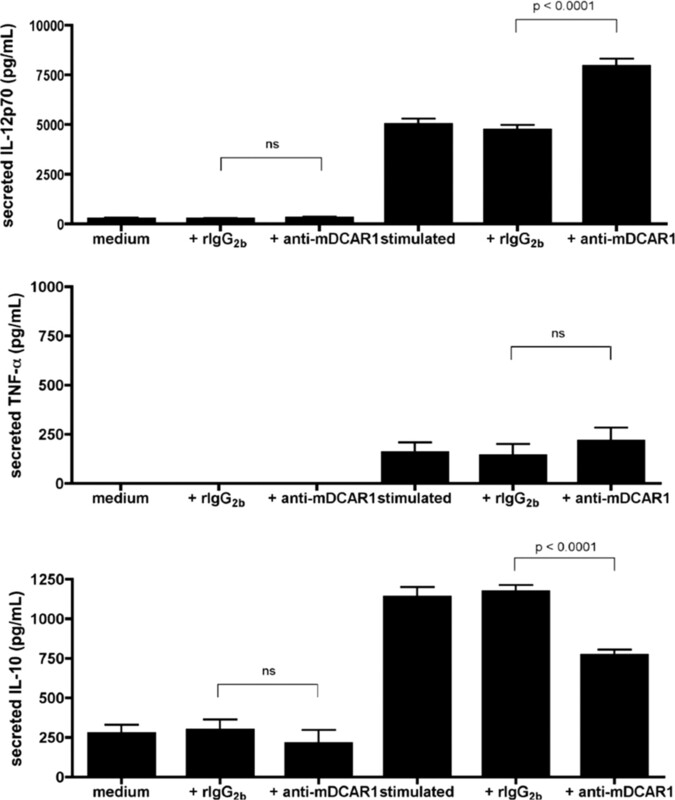 mDCAR1 triggering has no impact on cytokine secretion of DC in steady state (Fig. 5⇓). However, the presence of anti-mDCAR1 mAb significantly increased the level of IL-12p70 secreted by activated DC compared with isotype control or without Ab. The amount of TNF-α was not significantly increased, and no IFN-α could be detected (data not shown) after receptor ligation. Strikingly, CD8+ DC produced 35% less IL-10 when mDCAR1 was triggered (769 ± 36 pg/ml) compared with isotype mAb cultured DC (1172 ± 42 pg/ml). 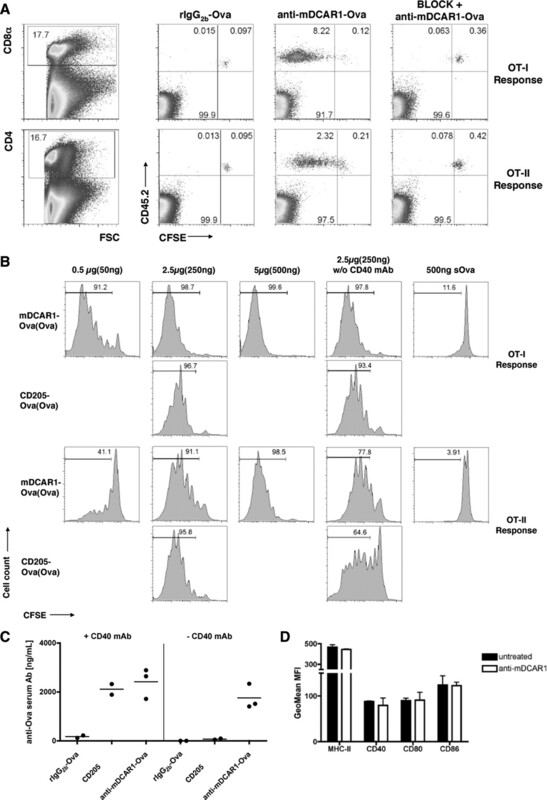 mDCAR1 triggering influences cytokine profile of activated CD8+ DCs. Splenic CD8+ DCs were cultured for 24 h, either unstimulated or stimulated with CD40L and CpG in the presence or absence of anti-mDCAR1 mAb or isotype-matched control mAb. Cytokine levels in culture supernatants were determined using ELISA. All data are means ± SEM of duplicate wells derived from supernatants of four independent experiments (significance was determined using the unpaired Student t test). In conclusion, upon triggering mDCAR1, the cytokine profile of activated CD8+ DC is biased toward a proinflammatory response. Located next to the NK complex, the APLEC is established as a separate gene complex encoding receptors that belong to the CLR family (5, 6, 10, 30). Several members of the CLR family have been implicated in microbial pattern recognition, Ag uptake and regulation of cell-mediated immune responses (3), whereas others are known only due to their genetic proximity. In this report, we describe mDCAR1 as a novel CLR based not only on the characteristic gene and amino acid sequence but also on the expression pattern and molecular function. mDCAR1 was identified as one of six CLRs after searching for mouse orthologs of the well-characterized BDCA-2 (CD303) and hDCIR. In accordance to the nomenclature introduced by Bates et al. (13) for DCIR and enlarged by Kanazawa et al. (21) with the characterization of DCAR, Flornes et al. (6) published an expanded analysis of the APLEC and named the resulting mouse receptors DCIR1, DCIR2, DCIR3, DCIR4, DCAR1, and DCAR2. To simplify matters, we renamed DCIR1 DCIR and DCAR2 DCAR, as described by Kanazawa et al. (30). Our in silico analysis confirmed the published data showing that in the mouse no direct assignable CD303-related CLR gene exists. In contrast, no human orthologs of the mDCAR and mDCAR1 genes exist based on a comparison of gene positions within the mouse and human APLEC. Nevertheless, mDCAR and mDCAR1 showed the highest equivalence to CD303 in terms of protein motifs predicted by amino acid sequences. The three receptors are characterized by highly related CTLD and positively charged residues in their short cytoplasmic tails suggesting a possible recognition of similar ligands and the initiation of related signal transduction pathways. However, the expression pattern of mDCAR1 was found to be totally different to CD303, which is restricted to PDC (12), thus excluding the possibility of a functional equivalence. Several CLRs are expressed on APCs and other phagocytes (7). By generating a specific anti-mDCAR1 mAb, we were able to show that the Ag is expressed on DC and myeloid cells in a tissue-dependent manner. mDCAR1 expression is restricted to CD8+ DC in spleen and the corresponding CD8+BP-1+ DC subset in thymus. BP-1 has been described as a specific marker for this DC subset in mouse thymus (27), which corresponds to the recently described CD8+Sirpα− DC (31). In addition, a heterogeneous non-DC population in BM and spleen was also found to express mDCAR1. According to the expression of CD11b, F4/80, and Gr-1, these cells represent subpopulations of monocytes/macrophages and granulocytes. As flow cytometric analysis revealed, F4/80 expression on mDCAR1+ cells was low compared with classical macrophages, confirming that mDCAR1+ cells are distinct from F4/80+ red pulp macrophages in spleen. Based on the coexpression of CD205, the majority of mDCAR1+ myeloid cells correspond to the DEC205+Gr-1low population reported by Lamb et al. (32), whereas a minority of mDCAR1+ cells display a different phenotype. Furthermore, we have evidence, that mDCAR1+ myeloid cells reflect certain precursor cells in BM (S. A. Kaden et al., manuscript in preparation). Corresponding DC subsets and myeloid cells present in lymph nodes and peripheral blood did not show any detectable levels of mDCAR1. The tissue-specific expression pattern of mDCAR1 could reflect a distinct function that is restricted to these tissues, but identification of potential ligands is required to test this hypothesis. Because single-nucleotide polymorphisms in genes of the DCIR/CD303/DCAR family, particularly DCAR1 in rats (10), are associated with a predisposition to autoimmune diseases such as rheumatoid arthritis (9, 11), potential ligands of mDCAR1 could include not only foreign but also self-Ags. The expression of mDCIR, mDCIR2, mDCIR3, mDCIR4, mDCAR, and mDCAR1 has thus far been demonstrated only at the mRNA level (6, 20, 21). The mRNA expression of mDCIR2 and mDCAR1 on NK cells, based on analysis of cells derived from spleen (6), contradicts both the protein expression pattern demonstrated here for mDCAR1 using specific mAb and that described for mDCIR2 (22). Therefore, the reported expression patterns of the remaining mouse CLR that are based on mRNA analysis need careful reconsideration and should be verified at the protein level. CD8+ DCs were reported to have the capacity to cross-present exogenous Ags on MHC class I molecules and, as a consequence, activate CD8+ T cells (33, 34, 35). CD8+ DC are also effective inducers of CD4+ T cell responses (36). The expression of CLR on APCs, such as CD8+ DCs, is often linked to a prominent function of these receptors, which is the uptake of Ag for further processing and presentation. mDCAR1 serves as an Ag uptake receptor and Ag uptake leads to the initiation of Ag-specific T cell responses as shown by the internalization of mDCAR1-anti-mDCAR1 mAb complexes. OVA delivery via mDCAR1 in vivo resulted in the proliferation of both CD8+ and CD4+ T cells, which was qualitatively and quantitatively comparable with CD205-mediated uptake, indicating that internalized Ag was presented on both MHC class I and class II molecules. 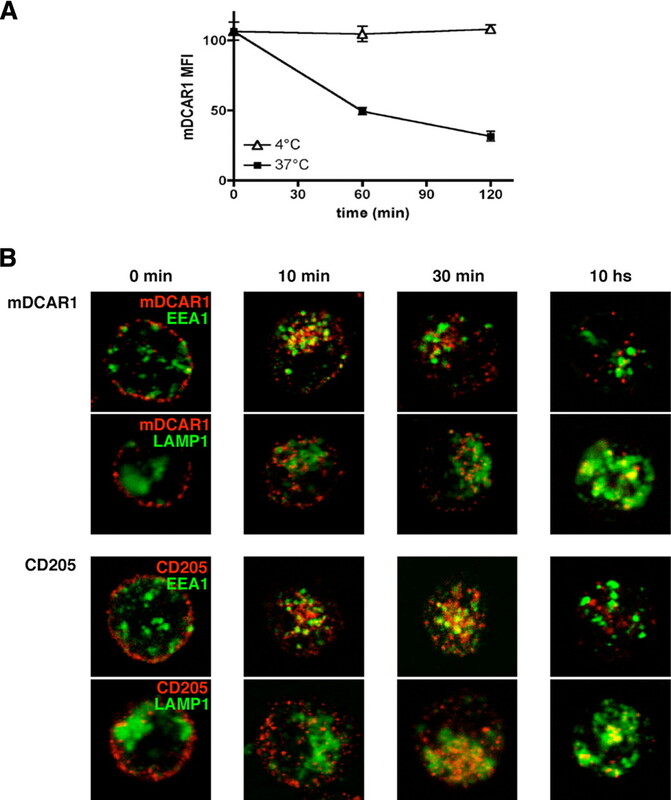 Intracellular trafficking of internalized anti-mDCAR1 mAb into EEA1+ early endosomes and late LAMP-1+ endosomes/lysosomes are prerequisites for the observed CD8+ and CD4+ T cell responses, as reported for CD205 (37), as well. Whereas distinctive MHC class I-restricted or MHC class II-restricted Ag presentation were reported for other CLR and non-CLR, as reviewed by Burgdorf and Kurts (38). mDCAR1+ myeloid cells correspond in their main part to CD205+ myeloid cells that were ascribed to have a very low T cell activation capacity compared with the activation potential of DC (32). Furthermore, the administration of low doses of fluorochrome-conjugated anti-mDCAR1 mAb preferentially labeled CD8+ DC rather than myeloid cells indicating that anti-mDCAR1 mAb predominantly targets CD8+ DC after i.v. application. How could the observed immune responses be interpreted that occurred in the absence of CD40 stimulation when Ag was delivered via mDCAR1? The overall theory that Ag presented on steady-state DC induces T cell tolerance, whereas presentation on activated APCs leads to immunity, is supported by experiments in which Ag was targeted to the multilectin receptor CD205 (26, 39, 40). Thereby, tolerance induction by CD8+ DCs is accompanied by proliferation of T cells and finally results in deletion of autoreactive T cells (41, 42). Recently, other novel CD8+ DC-expressed CLRs, CLEC9A and CLEC12A, have been reported to induce humoral and cellular responses in the absence of activating agents (43, 44), which is contrary to the above-mentioned generalization, but is in line with responses induced after mDCAR1-mediated Ag uptake. Determined via expression levels of costimulatory molecules and MHC class II on the surface of mDCAR1+ cells, triggering mDCAR1 does not result in APC activation. However, receptor triggering and the fact that steady-state CD8+ DCs already express increased levels of costimulatory molecules and MHC class II might synergize to influence APC function toward T cell stimulatory capacity. It remains elusive whether Ag internalized via certain CLR may gain unhampered access to the Ag processing and presentation pathways independent on the activation state of the DC. Independent of Ag uptake, interaction of Ags with CLR regulate DC-induced immune responses (28). This includes the inhibition of cytokine release by activated DCs, as described for CD303 (18) and hDCIR (15, 16), where mAbs were used to mimic specific interactions between CLR and the putative ligands. To elucidate the influence of triggering mDCAR1 on the DC-mediated cytokine response, we analyzed cytokines described to be secreted by CD8+ DC including IL-12, IL-10, TNF-α, and IFN-α (29). Triggering mDCAR1 on activated DC enhanced the secretion of IL-12p70, whereas IL-10 release was inhibited. This agrees with the finding that the presence of IL-10 negatively influences IL-12p70 release in activated CD8+ DCs (29). Thus, inhibition of IL-10 upon mDCAR1 triggering might favor the IL-12p70 release and, as a consequence, CD8+ DCs would be biased toward a proinflammatory response. The regulation of cytokine release by CLR requires signal transduction initiated after receptor triggering. As revealed by in silico protein analysis, mDCAR1 was found to lack such signal transduction motifs. Closely related CLRS, such as CD303, mDCAR, and further Dectin-2 and Mincle, have been reported to signal via an associated ITAM-bearing FcR γ-chain (21, 45, 46, 47). Therefore, interaction of mDCAR1 with FcR γ-chain is highly expected but needs further verification. In conclusion, our data showed that mDCAR1 is a functional receptor on CD8+ DCs and myeloid cells and provided further insights into the regulation of immune responses by CLR. We thank Sebastian Fuchs and Melanie Jungblut for expert technical assistance and Dr. Ian Johnston for helpful discussions and comments on the manuscript. ↵2 Abbreviations used in this paper: CLEC, C-type lectin; CTLD, CLEC-like domain; CLR, CLEC receptor; APLEC, Ag-presenting CLR gene complex; DC, dendritic cell; DCIR, DC immunoreceptor; DCAR, DC immunoactivating receptor; PDC, plasmacytoid DC; CHO, Chinese hamster ovary; RBL, rat basophilic leukemia; h, human; r, rat; m; mouse (h, r, and m in combinations). Weis, W. I., M. E. Taylor, K. Drickamer. 1998. The C-type lectin superfamily in the immune system. Immunol. Rev. 163: 19-34. Drickamer, K.. 1999. C-type lectin-like domains. Curr. Opin. Struct. Biol. 9: 585-590. Geijtenbeek, T. B., S. J. van Vliet, A. Engering, B. A. 't Hart, Y. van Kooyk. 2004. Self- and nonself-recognition by C-type lectins on dendritic cells. Annu. Rev. Immunol. 22: 33-54. Zelensky, A. N., J. E. Gready. 2005. The C-type lectin-like domain superfamily. FEBS J. 272: 6179-6217. Balch, S. G., D. R. Greaves, S. Gordon, A. J. McKnight. 2002. Organization of the mouse macrophage C-type lectin (Mcl) gene and identification of a subgroup of related lectin molecules. Eur. J. Immunogenet. 29: 61-64. Flornes, L. M., Y. T. Bryceson, A. Spurkland, J. C. Lorentzen, E. Dissen, S. Fossum. 2004. Identification of lectin-like receptors expressed by antigen presenting cells and neutrophils and their mapping to a novel gene complex. Immunogenetics 56: 506-517. Burgdorf, S., A. Kautz, V. Böhnert, P. A. Knolle, C. Kurts. 2007. Distinct pathways of antigen uptake and intracellular routing in CD4 and CD8 T cell activation. Science 316: 612-616. Wandstrat, A., E. Wakeland. 2001. The genetics of complex autoimmune diseases: non-MHC susceptibility genes. Nat. Immunol. 2: 802-809. Lorentzen, J. C., L. Flornes, C. Eklöw, L. Bäckdahl, U. Ribbhammar, J. P. Guo, M. Smolnikova, E. Dissen, M. Seddighzadeh, A. J. Brookes, et al 2007. Association of arthritis with a gene complex encoding C-type lectin-like receptors. Arthritis Rheum. 56: 2620-2632. Fujikado, N., S. Saijo, T. Yonezawa, K. Shimamori, A. Ishii, S. Sugai, H. Kotaki, K. Sudo, M. Nose, Y. Iwakura. 2008. DCIR deficiency causes development of autoimmune diseases in mice due to excess expansion of dendritic cells. Nat. Med. 14: 176-180. Dzionek, A., A. Fuchs, P. Schmidt, S. Cremer, M. Zysk, S. Miltenyi, D. W. Buck, J. Schmitz. 2000. 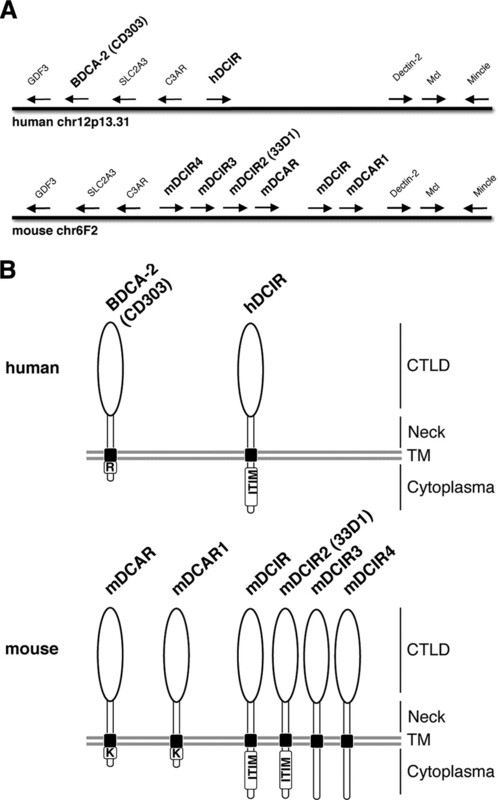 BDCA-2, BDCA-3, and BDCA-4: three markers for distinct subsets of dendritic cells in human peripheral blood. J. Immunol. 165: 6037-6046. Bates, E. E., N. Fournier, E. Garcia, J. Valladeau, I. Durand, J. J. Pin, S. M. Zurawski, S. Patel, J. S. Abrams, S. Lebecque, P. Garrone, S. Saeland. 1999. APCs express DCIR, a novel C-type lectin surface receptor containing an immunoreceptor tyrosine-based inhibitory motif. J. Immunol. 163: 1973-1983. Richard, M., N. Thibault, P. Veilleux, R. Breton, A. D. Beaulieu. 2003. The ITIM-bearing CLECSF6 (DCIR) is down-modulated in neutrophils by neutrophil activating agents. Biochem. Biophys. Res. Commun. 310: 767-773. Meyer-Wentrup, F., D. Benitez-Ribas, P. J. Tacken, C. J. Punt, C. G. Figdor, I. J. de Vries, G. J. Adema. 2008. Targeting DCIR on human plasmacytoid dendritic cells results in antigen presentation and inhibits IFN-α production. Blood 111: 4245-4253. Meyer-Wentrup, F., A. Cambi, B. Joosten, M. W. Looman, J. M. de Vries, C. G. Figdor, G. J. Adema. 2008. DCIR is endocytosed into human dendritic cells and inhibits TLR8-mediated cytokine production. J. Leukocyte Biol. 85: 518-525. Jaehn, P. S., K. S. Zaenker, J. Schmitz, A. Dzionek. 2008. Functional dichotomy of plasmacytoid dendritic cells: antigen-specific activation of T cells versus production of type I interferon. Eur. J. Immunol. 38: 1822-1832. Dzionek, A., Y. Sohma, J. Nagafune, M. Cella, M. Colonna, F. Facchetti, G. Günther, I. Johnston, A. Lanzavecchia, T. Nagasaka, et al 2001. BDCA-2, a novel plasmacytoid dendritic cell-specific type II C-type lectin, mediates antigen capture and is a potent inhibitor of interferon α/β induction. J. Exp. Med. 194: 1823-1834. Cambi, A., M. Koopman, C. G. Figdor. 2005. How C-type lectins detect pathogens. Cell. Microbiol. 7: 481-488. Kanazawa, N., T. Okazaki, H. Nishimura, K. Tashiro, K. Inaba, Y. Miyachi. 2002. DCIR acts as an inhibitory receptor depending on its immunoreceptor tyrosine-based inhibitory motif. J. Invest. Dermatol. 118: 261-266. Kanazawa, N., K. Tashiro, K. Inaba, Y. Miyachi. 2003. Dendritic cell immunoactivating receptor, a novel C-type lectin immunoreceptor, acts as an activating receptor through association with Fc receptor γ chain. J. Biol. Chem. 278: 32645-32652. Dudziak, D., A. O. Kamphorst, G. F. Heidkamp, V. R. Buchholz, C. Trumpfheller, S. Yamazaki, C. Cheong, K. Liu, H. W. Lee, C. G. Park, R. M. Steinman, M. C. Nussenzweig. 2007. Differential antigen processing by dendritic cell subsets in vivo. Science 315: 107-111. Vremec, D., K. Shortman. 1997. Dendritic cell subtypes in mouse lymphoid organs: cross-correlation of surface markers, changes with incubation, and differences among thymus, spleen, and lymph nodes. J. Immunol. 159: 565-573. Wu, L., D. Vremec, C. Ardavin, K. Winkel, G. Süss, H. Georgiou, E. Maraskovsky, W. Cook, K. Shortman. 1995. Mouse thymus dendritic cells: kinetics of development and changes in surface markers during maturation. Eur. J. Immunol. 25: 418-425. Robinson, M. J., D. Sancho, E. C. Slack, S. Leibund Gut-Landmann, C. Reis e Sousa. 2006. Myeloid C-type lectins in innate immunity. Nat. Immunol. 7: 1258-1265. Hochrein, H., K. Shortman, D. Vremec, B. Scott, P. Hertzog, M. O'Keeffe. 2001. Differential production of IL-12, IFN-α, and IFN-γ by mouse dendritic cell subsets. J. Immunol. 166: 5448-5455. Kanazawa, N.. 2007. Dendritic cell immunoreceptors: C-type lectin receptors for pattern-recognition and signaling on antigen-presenting cells. J. Dermatol. Sci. 45: 77-86. Proietto, A. I., M. H. Lahoud, L. Wu. 2008. Distinct functional capacities of mouse thymic and splenic dendritic cell populations. Immunol. Cell Biol. 86: 700-708. Lamb, R. J., R. J. Capocasale, K. E. Duffy, R. T. Sarisky, M. L. Mbow. 2007. Identification and characterization of novel bone marrow myeloid DEC205+Gr-1+ cell subsets that differentially express chemokine and TLRs. J. Immunol. 178: 7833-7839.
den Haan, J. M., S. M. Lehar, M. J. Bevan. 2000. CD8+ but not CD8− dendritic cells cross-prime cytotoxic T cells in vivo. J. Exp. Med. 192: 1685-1696. Pooley, J. L., W. R. Heath, K. Shortman. 2001. Cutting edge: intravenous soluble antigen is presented to CD4 T cells by CD8− dendritic cells, but cross-presented to CD8 T cells by CD8+ dendritic cells. J. Immunol. 166: 5327-5330. Schnorrer, P., G. M. Behrens, N. S. Wilson, J. L. Pooley, C. M. Smith, D. El-Sukkari, G. Davey, F. Kupresanin, M. Li, E. Maraskovsky, et al 2006. The dominant role of CD8+ dendritic cells in cross-presentation is not dictated by antigen capture. Proc. Natl. Acad. Sci. USA 103: 10729-10734. Kronin, V., C. J. Fitzmaurice, I. Caminschi, K. Shortman, D. C. Jackson, L. E. Brown. 2001. Differential effect of CD8+ and CD8− dendritic cells in the stimulation of secondary CD4+ T cells. Int. Immunol. 13: 465-473. Mahnke, K., M. Guo, S. Lee, H. Sepulveda, S. L. Swain, M. Nussenzweig, R. M. Steinman. 2000. The dendritic cell receptor for endocytosis, DEC-205, can recycle and enhance antigen presentation via major histocompatibility complex class II-positive lysosomal compartments. J. Cell Biol. 151: 673-684. Burgdorf, S., C. Kurts. 2008. Endocytosis mechanisms and the cell biology of antigen-presentation. Curr. Opin. Immunol. 20: 89-95. Bonifaz, L. C., D. P. Bonnyay, A. Charalambous, D. I. Darguste, S. Fujii, H. Soares, M. K. Brimnes, B. Moltedo, T. M. Moran, R. M. Steinman. 2004. In vivo targeting of antigens to maturing dendritic cells via the DEC-205 receptor improves T cell vaccination. J. Exp. Med. 199: 815-824. Kurts, C., H. Kosaka, F. R. Carbone, J. F. Miller, W. R. Heath. 1997. Class I-restricted cross-presentation of exogenous self-antigens leads to deletion of autoreactive CD8+ T cells. J. Exp. Med. 186: 239-245. Belz, G. T., G. M. Behrens, C. M. Smith, J. F. Miller, C. Jones, K. Lejon, C. G. Fathman, S. N. Mueller, K. Shortman, F. R. Carbone, W. R. Heath. 2002. The CD8α+ dendritic cell is responsible for inducing peripheral self-tolerance to tissue-associated antigens. J. Exp. Med. 196: 1099-1104. Caminschi, I., A. I. Proietto, F. Ahmet, S. Kitsoulis, J. Shin Teh, J. C. Lo, A. Rizzitelli, L. Wu, D. Vremec, S. L. van Dommelen, et al 2008. The dendritic cell subtype-restricted C-type lectin Clec9A is a target for vaccine enhancement. Blood 112: 3264-3273. Lahoud, M. H., A. I. Proietto, F. Ahmet, S. Kitsoulis, L. Eidsmo, L. Wu, P. Sathe, S. Pietersz, H.-W. Chang, I. D. Walker, et al 2009. The C-type lectin Clec12A present on mouse and human dendritic cells can serve as a target for antigen delivery and enhancement of antibody responses. J. Immunol. 182: 7587-7594. Röck, J., E. Schneider, J. R. Grün, A. Grützkau, R. Küppers, J. Schmitz, G. Winkels. 2007. CD303 (BDCA-2) signals in plasmacytoid dendritic cells via a BCR-like signalosome involving Syk, Slp65 and PLCγ2. Eur. J. Immunol. 37: 3327-3329. Sato, K., X. L. Yang, T. Yudate, J. S. Chung, J. Wu, K. Luby-Phelps, R. P. Kimberly, D. Underhill, P. D. Cruz, Jr, K. Ariizumi. 2006. Dectin-2 is a pattern recognition receptor for fungi that couples with the Fc receptor γ chain to induce innate immune responses. J. Biol. Chem. 281: 38854-38866. Yamasaki, S., E. Ishikawa, M. Sakuma, H. Hara, K. Ogata, T. Saito. 2008. Mincle is an ITAM-coupled activating receptor that senses damaged cells. Nat. Immunol. 9: 1179-1188.